Is Our Political System a Natural or Unnatural Disaster? … either way, it’s a disaster, right? I’ve been thinking about different types of disasters the last couple days as -- well -- I’m in Key West on vacation. Yep. Right in the middle of Isaac. Here's one of my favorite shots of the great time I'm having. Fortunately the impacts here were far less dramatic than anticipated. In fact Isaac turned out to be less of a tropical storm and more of a tropical snit. Or a tropical cranky pants. On the other hand, as of this writing it looks like New Orleans and the rest of the Gulf Coast may not be so lucky. Can we all just take a minute to send good vibes out to those in Isaac’s path? Go ahead. I’ll wait. · Why Our Political System is a Natural Disaster: Frankly, the founding fathers designed our U.S. system of government to be completely and totally inefficient. They erred more toward promoting inertia as opposed to action. Imagine running a business or association (or family) with 535 people on your board of directors. This means that at least 270 people (1/2 the House plus ½ the Senate plus the President) must agree to the exact language of legislation before it can become law. And these are people with more than your average size egos. For anyone seeking to achieve anything that’s a recipe for disaster. · Why it’s an Unnatural Disaster: All that said, the founding fathers also assumed (by the way, see my Influence Game blog post on “assumption”) that everyone would be grown-ups and work toward compromises to benefit not only their constituencies but the overall good of the country. Not so much lately, right? This happens because people -- not words on a piece of paper -- implement the processes and structures of government. Whenever you get people involved there’s always considerable room for an unnatural mess. In addition, although we don’t want to accept responsibility, citizens perpetuate the problems. Knee-jerk reactions, extreme partisanship and unwillingness to compromise aren’t exclusive to politicians. Let’s all take a look at our actions, thoughts and beliefs to see if we can tone down the political storm a little. No one wants a hurricane. I just returned from a fantastic trip to Japan, and while I’m not a huge fan of my current jet lagged state, it was definitely worth it. This was my first visit (hopefully not the last) to the Land of the Rising Sun – a very appropriate name by the way – and during my time there I noticed some very interesting cultural differences. The one that stood out to me the most was the tendency to do what is best for the group rather than for the individual (and it goes without saying that I’m generalizing a bit). It was a collection of small observations I made throughout my stay that led me to this conclusion. For example, if a group of three friends are riding on the subway but only two seats are available, all three will remain standing – even if there is no one else vying for those seats. If you go out to dinner with someone and there is sake at the table, you are not supposed to refill your own glass – instead you pour drinks for one another. It can take you an hour to find an outdoor garbage receptacle in Tokyo, but you won’t find one piece of litter on the ground. I was very impressed by this community-centric mentality, and it got me thinking about how these principles can and should be applied in the world of advocacy. While you do have power as an individual advocate, it’s those grassroots campaigns that consider the needs of the entire community they represent with their issue that are truly successful. As an organization or association representing a particular issue area, you should look for other groups with like-minded interests and work together to propel each other forward. As an individual advocate, if you are planning to meet with a Member of Congress it may be tempting to arrange a one-on-one meeting so you can spend as much time as possible telling your personal story to your Congressman. But think about how much more effective the meeting might be if you have two or three constituents with the same message but different stories and perspectives. At the very least you can stand if there aren’t enough seats for everyone in the meeting. Do you have thoughts on how housing data is collected? If so, HUD wants to hear from you. Sponsored by HUD and conducted by the Census Bureau, the American Housing Survey is the largest, most comprehensive housing survey in the country. It focuses specifically on individual housing units over long periods of time, gathering information on occupancy, vacancy, costs, and conditions on the same units every two years. The American Housing Survey is comprised of both a National survey, which is conducted every other odd-numbered year, and a Metropolitan survey, which is conducted in selected areas on a rotating basis. The data collected sheds light on the supply and demand in the housing marketplace and the condition of the nation’s housing stock. It also helps HUD develop policies and design programs for different types of needs, such as the elderly and first-time homebuyers. HUD is seeking comments on the necessity of the survey and the accuracy of its data, along with suggestions on quality improvements and ways to make the process more efficient. and Comments are due on October 19. More information is available here http://www.gpo.gov/fdsys/pkg/FR-2012-08-20/pdf/2012-20420.pdf. Sure, the fact that Mr. Romney’s effective income tax rate is considerably less than many taxpayers will, no doubt, add fuel to the fire over whether our tax code favors wealthier Americans. The debate will continue to rage in the coming months as Congress considers extending the Bush tax cuts. In looking at these tax breaks, policy makers must wrestle with striking the right balance between those who work for their money and those whose money works for them. Is the code too progressive? Not progressive enough? Does it encourage investment? Or hoarding? I can’t answer these questions because I’m biased. Frankly, my money is very lazy. It might as well be sitting on the couch eating Cheetos and watching reality television for all the work it does out there in the world. To some degree, though, that’s a problem I can’t blame on the tax code. Maybe I need to employ a little tough love, kick that money out the door and make it get a job. At the same time, I do know that my tax dollars are working hard (and I can see what they’re doing through the charts at http://nationalpriorities.org/). These dollars may not always be working on the jobs I’d like, but I’m certainly proud of some of the investments I’ve made. Sometimes I forget that the end goal of complying with the tax code shouldn’t be to hoard as much of my money as I can. Sometimes the goal should be to make investments in our nation and its citizens. That’s not necessarily a bad use of my dollars. It’s certainly better than sitting on the couch and eating Cheetos. The Workforce Investment Act, WIA, was passed in 1998 to replace the Job Training Partnership Act. The bill aimed to revamp the US workforce system using Workforce Investment Boards, WIBs, that are made up of parties with vested interests in employment, i.e. private sector employers, local community officials, etc. The bill plays an important part in funding the One-Stop Centers and programs like The Jobs Corps. Currently, the House is working on its version on of the WIA reauthorization, H.R. 4297. The bill consolidates 19 programs into one account that will function similar to a block grant for states. The bill was voted out of committee and is awaiting floor time. House Education and Workforce committee Chairman John Kline (R-MN) discussed possible scenarios for the House WIA reauthorization in an interview on C-SPAN in June. 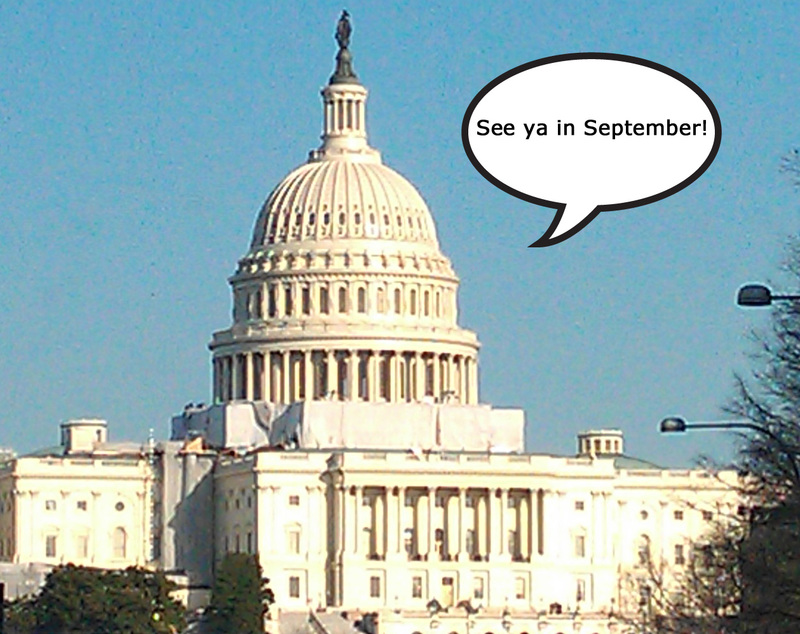 On the Senate side, the WIA reauthorization continues to be stalled. The Senate HELP committee released a draft version in June 2011 and a markup session was scheduled for the same month. Unfortunately, the markup was cancelled and there hasn't been any progress to reschedule the hearing during the next legislative session. Although workforce training is an important issue, the WIA reauthorization may have to wait until the next Congress takes up the issue. The August Recess- Why It Exists and How to Advocate During the "Vacation"
It's August, the time when Congress is out of session for a month and everyone in the country asks, "Why the @#*^! are they taking a break?!" I understand the frustration, especially since issues like sequestration, tax reform, the several other issues remain unfinished. Historically, back in the years of horse and buggy, the buildings our legislators worked in had no air conditioning. In August, the humidity in D.C. is OUTRAGEOUS. As a result, the House and Senate would adjourn for the month of August to run home just as the awful humidity began. During the 1960s, the August recess became law because many legislators wished to spend some time with their families. As you can probably imagine (or remember for some of you), the 1960s was a busy time for Congress. For members today, the recess is not a big vacation in the Bahamas or Cancun. The overwhelming majority of our legislators use the recess as an opportunity to return to their districts and reconnect with their constituents. Especially during an election year. Regardless of how you feel about the recess, this can be a great opportunity for you to advocate for your issue. I would highly advise against having a lobby day, congressional briefing, or a meeting with congressional staffers in DC during August. Now is the time for your organization to turn its focus to creating a better relationship with the legislator IN THE DISTRICT. Connecting with your legislator in his or her home district will have a significant impact on the relationship as it solidifies your organization’s status as a vocal constituent group. Attending town hall meetings, arranging to have the legislator visit your workplace, or a simple meeting with the legislator will be enormously powerful in building a relationship with your Congressperson or Senator. The relationship you build today will be crucial tomorrow when you make your ask during the very busy session that is anticipated to occur once Congress returns. Stephanie Vance, aka The Advocacy Guru, sat down for an interview with professional keynote speaker and entertainer Craig Price. 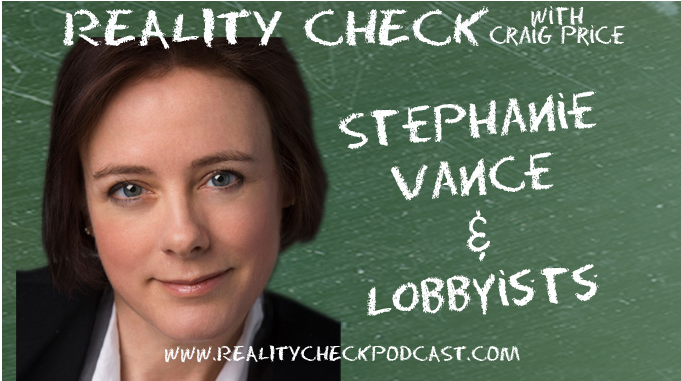 As a former Capitol Hill staffer and lobbyist, Stephanie shares her insights into how Washington D.C. works. She debunks myths about lobbying and describes what a "special interest" really is. The podcast will also provide you with tips to influence the decisions made in a Congressional office. Listen to the blog cast here. If you wish to learn more about influencing a Congress, visit Stephanie's blog based on her new book, The Influence Game. Follow Stephanie on Twitter.